Unlike my other Build-Guides which mostly focus on ES-Characters this time I have an Slayer-Overleeching-VaalPacting Life-based Bow Build! It is a versatile Bow-Character base that can basically run any and all bow skills. The first big thing about it is that it is cheap to start out and scales really well into the endgame with more investment - It is fully Endgame and UberElder viable on 5-links alone. 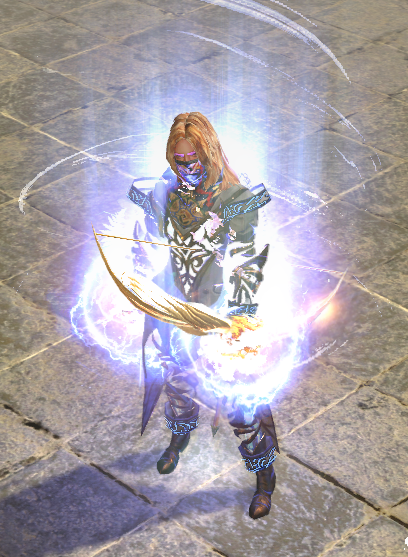 It does some really funky stuff with the conversion mechanics and utelizes the second Scion Ascendancy we pick - Elementalist - to an degree that is not often found in other Builds. Its other Scion-Ascendency pick is Slayer for its super strong overleech mechanic fuelled by Vaal Pact which almost feels mandatory for Life based builds that want to tackle the EndGame. Between those two Ascendencies the build is also totally immune to both physical and elemental reflect. Making this a true 'all content' build. Disclaimer: I am not a big league player - I find playing league and leveling boring and to be a chore. I do enjoy making builds though - that's why I give people I know and trust builds of mine -on request- to play during league. I gotta do what I like in the game - making builds - and others enjoy cheap builds (since they tend to be slightly off-meta - at least till I post a guide ^^'). Anyhow! The reason I say this is because the Videos and ItemLinks in this thread will be provided by YT_HB and not me. I did create a barebones version of this character on standard to test things out and did shaper with it - and at this point I gave YT_HB the PoB/Build so he could play it this league. In short: A 7k+ Life, Vaal Pact, Overleeching, Immune to all Reflect Types, Bow-Build with 3-Mio+ ShaperDPS while having Mirage-Archer linked up. Also no 'shocked' state checked or other shifty things enabled when it is questionably if they are appropiate. Its Deathless! :) Woop, Woop! Disclaimer: As always with my Build-Guides do take a look at the PoBs/GemLink sections instead of blindly copying items and gem-links from here. I will go over the Build Mechanics and its links as I post the items - I found this to be the better way to go about builds and explain the mechanics as opposed to making a seperate sections that noone really reads. This way people can put the mechanics I am talking about into relation to the gear used in this build. Also please note that the gear linked here is good - but by no means at all maxed out. I explain and elaborate on each gearpiece what is important and what could be improved with it if you want to spend more currency. Even like this though this build does a casual 4 Million DPS while Mirage Archer is socketed into the SkillLink. Its quite bonkers. This is pretty much the centerpiece of this Build - It is a fated (meaning it has a base variant that can be upgraded via prophecy) unique bow that costs about 1c to 5c; depending on daily prices. It has fairly low base physical damage but compensates that by giving *extra* elemental damage of *each* element. And a wooping 100% at that. That means for each point of physical damage you deal, you deal an extra point of lightning, cold and fire damage. Now - historically this bow has had a couple drawbacks - its low base phyiscal damage being one - and that it gives all its extra damage split over 3 elements is another one. The low physical damage made it hard to stack %-increases with it - since a % of a low value results in an total value thats still kinda low. This is something we can circumvent now though via abyss jewels who can roll with flat physical damage on them. Due to stat-sticks being rendered obsolete for melees those jewels are fairly cheap to come by nowadays. Another source of flat damage stacking comes from the fairly new Herald of Purity - made even better by a little quirk of the ScionElementalist Ascendancy - which buffs ALL Heralds by 40%. Thats a higher buff then the Witch Elementalist gets on the flat damage values and makes this interaction uniquely good with the Scion Elementalist. We link those 4 Heralds up with an Enlighten (Level 3 is fine - Level 4 feels a tad better) to make this a bit easier on our mana. If you do get around to 6link the bow eventually you can add Blind to the Heralds which synergises nicely with them due to not increasing the manaupkeep of the heralds and providing quality of life by blinding all enemies. The split elemental damage provided by the Doomfletch Prism is another bottleneck we need to circumvent; part of that is handled by our Ascendancy Elementalist. It provides us with general, non-element specific elemental penetration. This is a fairly rare modifier in the game, only found at one other point on the talent tree - which we naturally take as well. This combined on its own however would make our elemental damage only viable and not act like a multiplier which is usually the thing which makes elemental damage scale so well for so many Builds out there. This chestpiece is a synergistic element to the Doomfletch's Prism. On first glance it seems lackluster due to 5 links - but it supports socketed skills by the incredibly powerful support: "Level 20 Elemental Penetration" which adds general elemental penetration! For us - utelizing Doomfletch's Prism - which lets us deal extra elemental damage of all three types - this is the equivalent of linking our skill with Lightning Penetration, Cold Penetration AND Fire Penetration all at once. Effectivly making our 5-link an 8-link. That we get another Abyssal Jewel and get a bunch of other benefits from useing Abyssal Jewels is just iceing on the cake. Please note: depending on how many Abyssal Jewels you use and how good those are a 6linked Loreweave is a good alternative. Ultimatly the Shroud will outperform the Loreweave though IMO. If one followed along the guide and its conversion stuff from before it is easy to realise why this modifier is blatantly off-the-charts stupid good for us. It gives us extra Chaos Damage based on our physical Damage (which we stack via Abyss Jewels) - that physical damage then gets converted and amplified into ALL three kinds of elemental Damage - and of EACH one we also now get an % as extra Chaos Damage. We are essentially Quadro-dipping this More-Modifier. Other then that we look for a high life roll, elemental resists, phys and elemental damage, accuracy etc. We are fairly flexible on that front and the new crafting system can be used to craft something solid for cheap. Gives up to two abyssal sockets, is dirt cheap and provides incredibly good sustain while mapping. Spirit Burst is a strong mechanic which is very well known and liked by many players. Try to get one with an enchant for your choosen attack-skill. We can run basically almost any bowskill - this Build uses mostly Scourge Arrow and Rain of Arrows. Gives up to two abyssal sockets, provides us with Intimidate which is another More Multiplier when socketed with a Murderous Eye. Which we totally should socket into it. Ideally you get it with an Curse Corruption like Elemental Weakness - but those tend to be expensive. An Attack-Crit Corruption would also be good. And a double corruption of the both of them BiS. Gives up to two abyssal sockets. Solid stats otherwise, good movementspeed, destroys corpses and thus annoyingly dangerous 'on corpse' effects often found on strongboxes (corpseexplosion) or in deeper delves. The by far and hands down best enchant on them is the rare-ish "Penetrates % Elemental Resistances" roll. Luckily the Lab is really easy to do on this Build. The Quiver can have a multitude of different and good shaped as well as elder rolls - none of which we truely need though. Getting Life and Resists on this slot feels like the best option though. We use a fair amount of Unique Items on our other slots. If you can get your resists elsewere though you can spend a lot of currency on this. A shaped Steel Ring is best for the flat Physical Damage it provides. (found the theme with gear in this build yet? :P) Life, Resists and other stats one might be lacking can be found on this as well. The only reason this thing is shaped is to enable the Mark of the Elder Ring. If you can get this sort of ring with an 'Assassins Mark on Hit' roll on it, it would be perfect. Just make sure if you have that to not waste money on a curse on hit corruption on the gloves. We can only support one curse after all by default. Just a solid and cheap Damage Boost for Attack-based Builds. Also enables tentacle slaps. Yey. A Stygian Vise for Life and resists + another abyssal socket. They make the Scion Lifecluster Nodes stupid good, give resists and supercharge the nodes unlocked by the Unnatural Instinct. Making the %Life from the Scion Lifecluster stronger is of particular note since we stack a lot of flat life from Abyss Jewels. So the %-increase we get from the Lifecluster this way is really strong for us. Pure Talent helps with stats and leech and enables some tree varations - like pathing to the shadow area if one is so inclined. Not strictly needed in this build however. If you can get a corrupted one to make you immune to corrupted blood it would be neat. You can have that corruption though on any other jewel you use as well. The secret stars of this Build! Everything else like resists, ele penetration, crit or crit-multi etc are nice but ultimatly just a bonus. This makes gearing this fairly easy since those two rolls can actually be alt-spammed or grabbed for cheap on the market. But if one whishes to invest a lot into this build one can do as well. This makes this build so nice to scale. Of note in the tree is the small ManaLeech node close to Vaal Pact - this enables us to leech Mana! Do not forget to take it, it is important! As mentioned in the Jewel section the Scion nodes outside the Lifecluster are not all that important. When leveling use your points to path down to VaalPact directly since you will not be able to start your tree from the Duelist node till your second Lab. During the leveling process you will get more then enough respecc points from quests to undo those couple of points and repath your tree once you are able to do so. While leveling you also might grab one of the LifeLeech nodes close to the small ManaLeech node we took opposite of VaalPact to enable LifeLeeching if you do not have a source of that on your gear. Later in the game we get LifeLeech from both Pure Talent (if we use it) and the LifeCluster close to the Shadow start. Herald of Purity + Herald of Ice + Herald of Thunder + Herald of Ash + Enlighten. Deactivate one of the Elemental Heralds of your choice while leveling/not having an Enlighten. You can 6link eventually and socket a Blind Support in it if you want. Or get blind somewhere else (abyssal jewels, shaped/elder mod on quiver etc) and use the last socket for something like Blink Arrow. Note: Damage on Full-Life works really well due to Slayer Overleech. If you have Blood Rage active it might look like you are not at full life - but you actually are. You can check that via tooltip. Its a known bug/curiosity with the interaction of those two gems. 3.6 Update: Replace Increase Critical Strikes with Infused Channeling if you use Scourge Arrow. Both are blue support gems so no need to switch colours on the bow. Lv 3 Immortal Call + Lv 1 Cast When Damage Taken. The gemlevel is of note here - normally you would want it as high as possible. Here it is best used like this. -> we can summon two Golems as ScionElementalist, so we make use of it. If you dont want to manually resummon them get an Abyssal Gear-Piece with just one Abyssal socket and link them up with an Cast When Damage Taken support-gem. Level that one up though till you can support the golems (which you should level up as well). Gives Frenzy Charges and AttackSpeed - is outhealed easily by the Slayer Overleech and SpiritBursts. Gotta go fast! And since Mirage Archer does most of the work anyhow we can can just zoom through the maps with this active while the MirageArcher does the work. Its also neat in delves if you are afraid of getting stuck in mobs. Atziris Promise is super bananas for the same reason the elder modifier on our Amulet is bananas. If you can balance your resists The Wise Oak is stupid good as well. The Hybrid flask is used only for no leech maps when I Blink Arrow too much and don't leech mana. The main flasks are the Wise Oak and Atziri. The quiver I used to balance res for Wise Oak. Nothing too special about it. The Hybrid flask I take only for no regen maps when I Blink Arrow too much and don't leech mana. The main flasks are the Wise Oak and Atziri. These worked just fine swapping out both rings and helm when doing pure breaches. Didn't notice any lack of damage. Thanks for letting me test out your build this league. I can honestly say that it's one of the most fun, well rounded builds I've played. It's very fast. The clear speed and single target damage are both crazy good. With Mirage Archer you can concentrate on fight mechanics rather than having to stop and aim your shot all the time. Because of that, bosses are easy. I had that one death on that uber elder vid only cause I got lazy at the very end. Doing the fight deathless wouldn't be a problem at all. Once I reach 100 I'll work on getting Elder back to the middle to record another video of a deathless kill. Still a work in progress but it's pretty solid. I was going to stop at level 95 but decided to keep going cause the build was so fun to play. 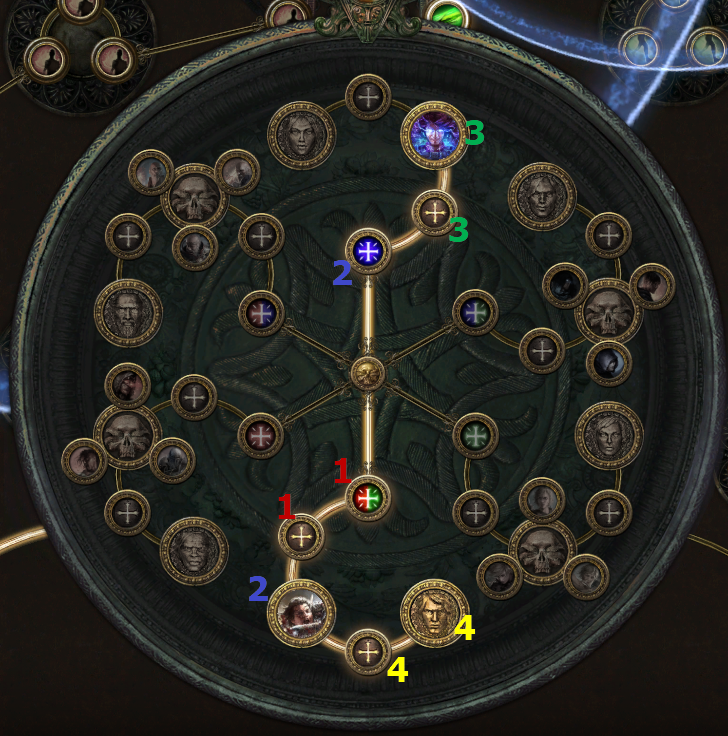 The nodes I decided to take after 95 were the 2 Bow Attack Speed and Crit nodes near Aspect of the Eagle. And also the 3 Accuracy and Crit nodes to Depth Perception. Connecting to the Shadow start (taking advantage of Pure Talent) was another option but with slightly less damage but more life. Build looks solid, gonna try it out. - I think Alira is better than 2 passive points. Unspeccing the 2 aspd/crit nodes next to Aspect of the Eagle and switching to Alira gave a tiny bit more dps, but also gives 15% all res so you can opt for more damage on some gear (like quiver). - Switching out 2 heralds (probably ash and thunder) for Wrath/Anger/Hatred with a Watcher's eye can also be a significant dps boost, at the cost of ~60 life (from switching out another jewel). The damage difference isn't too large with a 1 mod Watcher's, so it probably isn't worth, but it's pretty significant (like 10% with double Hatred mods) with a 2 mod. Alira can be better depending on where you are at with the talent tree - the one posted is one point away from Depth Perception which outperforms Alira. So yeah - it depends a bit on what stuff you can reach with those 2 Talent Points and which level you are. About Hatred+Watcher's Eye. Yes! More Damage is possible by doing other stuff. You can run Scourge Arrow with close to 20Mio DPS. The thing is: There is no point to it if it costs you survivability IMO. Which it would do. Less Life means, well, first and foremost less life which also means less leech etc. I kinda look at it through the 'value lens'. If one shot from the Mirror Archer clears the entire screen/bombs the boss into the next phase - what is the point of having more damage? You will not clear faster; you will not kill bosses faster. Thats like overcapping resistances. Having 300% overcapped all res is as useful as having 120% overcapped all res. Considering that this also will cost a lot of exalts and reduces the lifepool (and also will muck with the theme of the build! :P) I kinda fail to see the value doing this. Alira could be better depending on where you build is in regard to resists. I could definitely get a better quiver. The only reason I have that one is cause the resist tiers were all right for getting my resists even which is huge for this build with Wise Oak. That, and the life and some flat phys damage. Other than that, I know the quiver is mediocre. As for Wrath/Hatred, I did try that out as well. I had a couple Watcher's Eye's with Hatred or Wrath mods. It just wasn't needed. The synergy between the Heralds and the Elementalist Scion ascendancy works very well. That's one of the neat things about this build actually. You don't need crazy expensive gear to get it working well such as a Watcher's Eye, 6 links, etc. The unique jewels are the only required items that are pricey currently. Yes, I have my char pretty min/maxed gear-wise right now but when I did Uber Elder at level 89 I didn't have all these gg Eye jewels. I even swapped out my Mark of the Elder ring for a Dream Fragments and had no issue or lack of damage. Keep thinking about changes though. I haven't really thought about tree changes once I went above 95 so it's good to consider.